A few weeks back, H and I attended the second annual NYC Hot Sauce Expo, where we had the time of our lives sampling incredible, small batch crafted hot sauces in every flavor imaginable and meeting tons of great people. 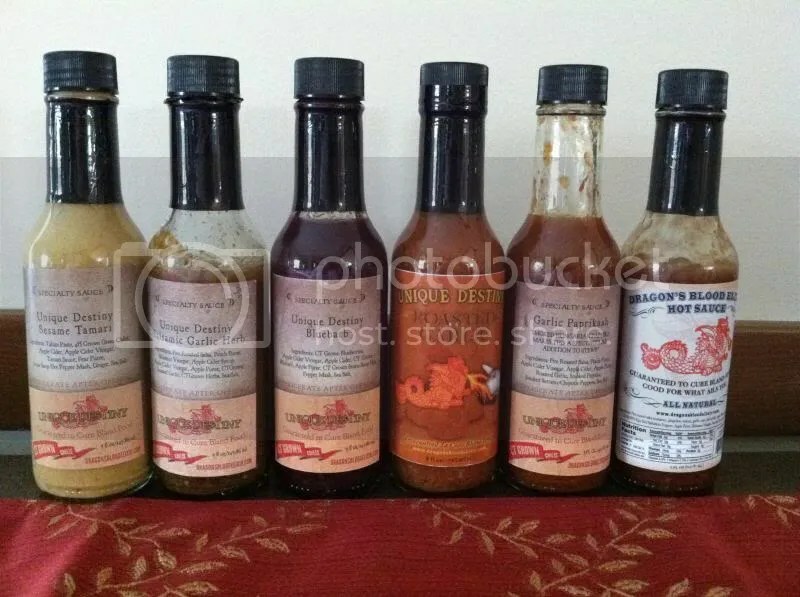 We also purchased and brought home dozens of bottles of those sauces, and I immediately got to work coming up with fun uses and recipes for some of our acquisitions. Last week, I began a new blog series called Spicy Spotlight, where I share some of these products and my uses for them. No one is paying me for this; I am only sharing because I have truly fallen in love with each and every one of these sauces and the incredible depth of flavor that they have added to my food. One of the most memorable tables I visited at the Expo was Dragon’s Blood Elixir. They piqued my curiosity with their name, but won my heart with their product. I didn’t try a single bad thing during the entire Expo, but the majority of vendors had one, maybe two, excellent products while the rest were good. At Dragon’s Blood, on the other hand, I tasted over a dozen samples and was completely wowed by every last one. The focus on producing sauces with real, identifiable flavor is immediately obvious as soon as it hits your tongue. Their signature ingredient in every sauce recipe is apple puree, which gives each one a lovely, subtle sweetness plus a wonderful, smooth texture. It took my friend and me at least a half hour to try all the samples they had available at the Expo, and the people staffing the booth were so friendly the whole time and seemed genuinely pumped to have us try their products. At the end I was having so much trouble narrowing down what I wanted to buy, and they were more than happy to let me taste and re-taste certain contenders to make my final decision. I ended up with 6 flavors: Sesame Tamari, Balsamic Garlic Herb, Bluebarb, Roasted Garlic, Garlic Paprikash, and of course the original Dragon’s Blood Elixir Hot Sauce. If you are the kind of person that can just sit and eat a pound of roasted vegetables and call it dinner, well, then get ready for the best dinner of your life. If you’re normal then go ahead and have it as a side dish. Pre-heat oven to 400 F. Place trimmed asparagus on a large rimmed baking sheet. Drizzle olive oil and hot sauce over them and toss to coat well. Add minced garlic over the top. Place in oven and roast for 12 minutes. Flip and roast an additional 8 minutes until browned and tender. Remove from oven and squeeze a slice of lemon over them before serving. Preheat oven to 400 F. Wash potatoes and pat them dry as best you can. If any of them are noticeably larger than the others, cut those into smaller pieces. Use a fork to poke a few holes in some of the bigger, whole potatoes. 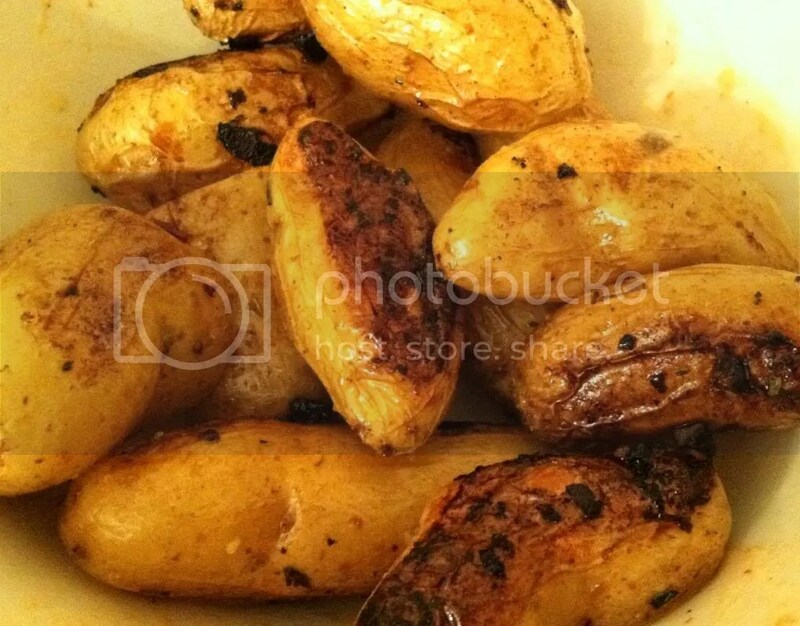 Spread potatoes on a large rimmed baking sheet. Add oil, hot sauce, and oregano, sprinkle with salt, and toss to coat well. If you like crispy (read: blackened) garlic, add it now. Otherwise wait (see below). Roast for 15 minutes, then remove from oven and stir. If you haven’t added the garlic yet, now is the time to do so. Return to oven and roast an additional 15 minutes or until browned and easily pierced with a fork. Add additional salt to taste. Enjoy hot with a little extra garlic paprikash sauce drizzled on top. 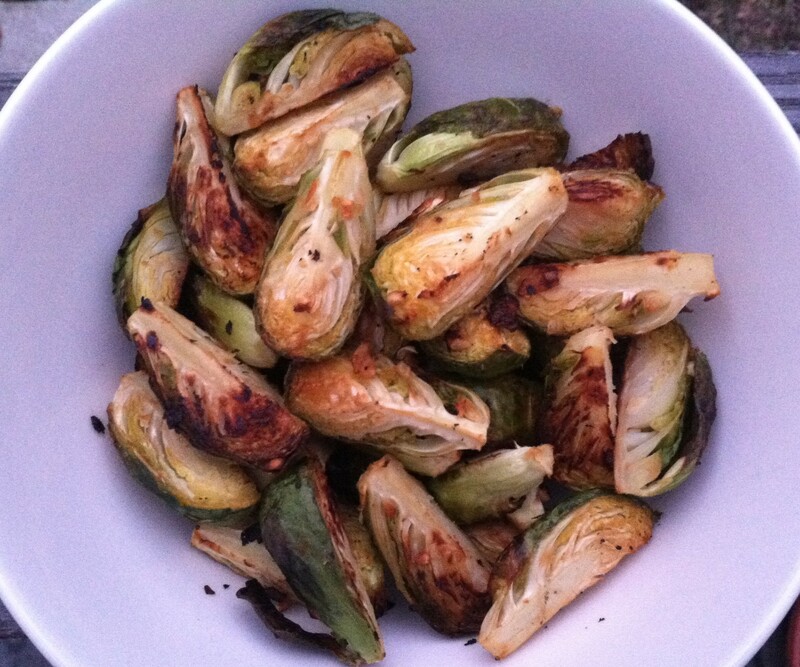 Preheat oven to 400 F. Spread quartered Brussels sprouts on a large rimmed baking sheet. Add sesame oil, hot sauce, and garlic, sprinkle with salt, and toss to coat well. Roast for 10 minutes, then flip or stir and roast an additional 10 minutes or until tender and browned. Remove from oven and add additional salt to taste before serving. I have to say, the Sesame Tamari sauce might be my ultra-fave. 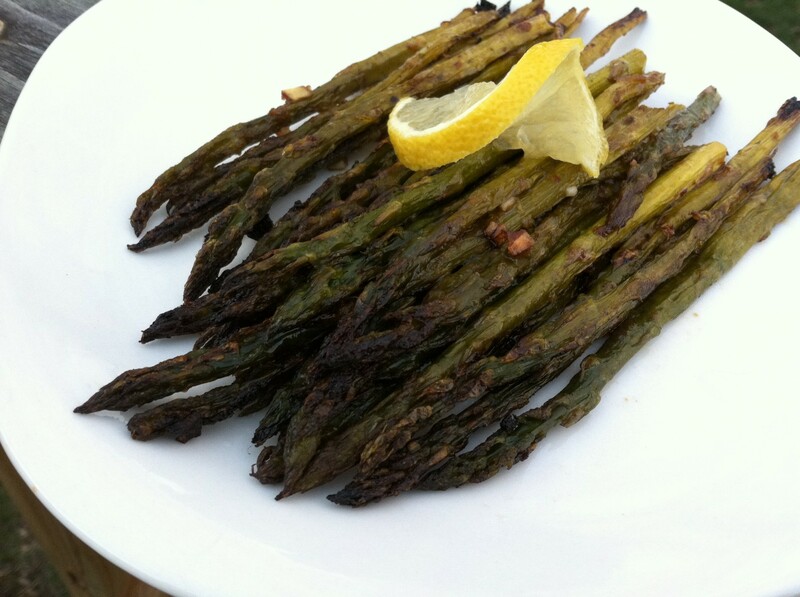 It tastes incredible on any and all manner of roasted vegetable. I also have grand plans for an Asian-style noodle bowl with like a gingery-peanutty-Sesame Tamari dressing, once horrible Passover ends and I can eat real food again. OMG it would be so good on falafel too! Okay done. More spicy fun to come next week! In the meantime have a wonderful weekend, and Happy Easter to those who celebrate. 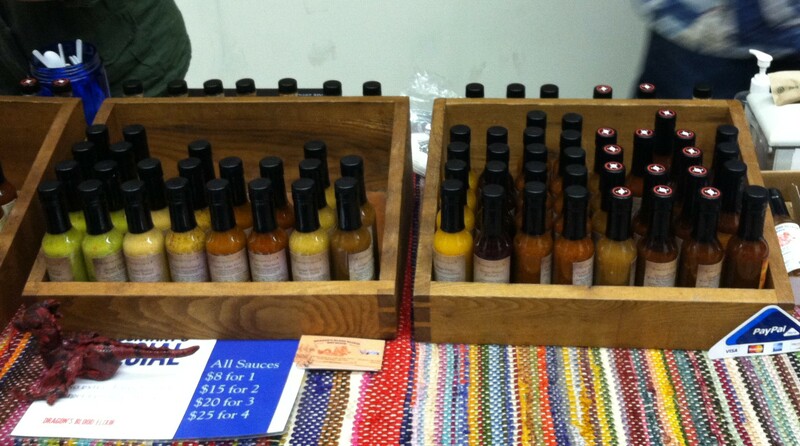 Click here to read last week’s Spicy Spotlight featuring NW Elixirs. Ashley, I didn’t think I could be more envious of your trip to the NYC Hot Sauce Expo, and you just keep making it worse!! I am a hot sauce fiend. I loooooove the stuff. The only thing that could be better in my mind would be a Sauerkraut Expo. Such a thing probably exists… Anyway, it sounds like you had the best time, and the fun lives on in your kitchen as you make all of these tasty new recipes. It all sounds delicious!